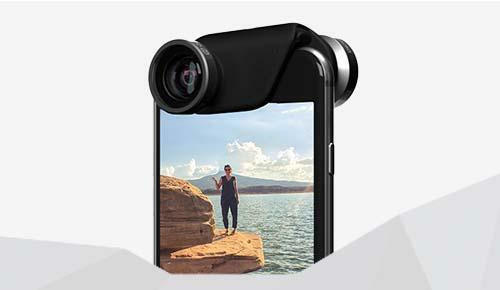 Olloclip has announced their latest 4-in-1 phone lens for iPhone 6 and iPhone 6 Plus. Want to fully show off your phonegraphy skills? The iPhone lens kit may be suitable for you. This is a practical and fun 4-in-1 iPhone lens kit that works with both iPhone 6 and iPhone 6 Plus. 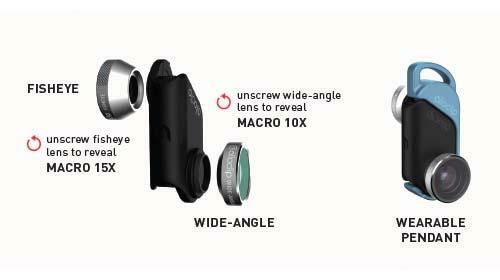 As we can see from the images, the iPhone lens system features an ultra compact design along with an included wearable pendant for easy to carry, and it comes with four advanced optics lenses, including a fisheye lens, a wide-angle lens and two macro lenses in order to improve the cameras of your iPhone 6/6 Plus, and the iPhone lens kit works on both front and rear-facing cameras, apart from that, the handy clip lets you easily clip it on and off your iPhone in seconds with no extra parts needed. The 4-in-1 iPhone lens kit comes in 5 tones and is priced at $79.99 USD. If you’re interested, jump to Olloclip official site for more details.